This week: an explainer for dimming LEDs, rebounding demand for sapphire, and Philips's shopping assistant. Soon after we wrote about the people-tracking lights at Newark airport, Philips announced a shopping assistant in which LED lighting in retail stores tracks the location of customers by way of their smartphones, in order to deliver to them messages relevant to what they are looking for and guide them to it on the shelves. One innovative detail: messaging between lights and smartphones is done via visible light communications, what some are calling Li-Fi. Privacy concerns are allayed by the "opt-in" nature of the system: No tracking takes place unless the shopper has downloaded the Philips app to their smartphone. 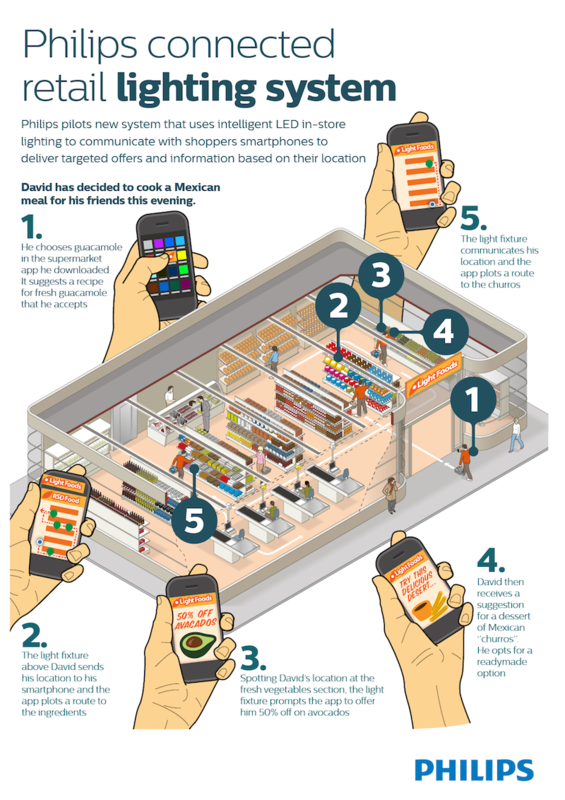 The shopping assistant system is being piloted with retailers, Philips says, and was demonstrated at the Euroshop retail show in Düsseldorf last week. The key thing to watch out for is the inrush current that is generated as the LED fitting turns on. This can be as high as 1A on a 7W fitting, and is the reason why all universal dimmers are downrated when used with LED. For example, the two-channel 400W Theben DMG2T can only drive 60W of LEDs. LED manufacturers rarely publish this information, so downrating the dimmer by 80% is a general rule. Back in the day when cutting and pasting were more literal than they are in this age, I could definitely have used the X-Light. 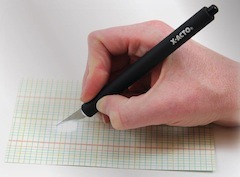 Four batteries (included with the knife) give up to three hours of bright white light "X-Actly" where it is needed most. Rubicon, the US-based supplier of sapphire boules, substrates, and windows for LED lighting and optics applications, says that demand for its products will be picking up now after a "challenging" 2013. Much of the increase is due to Apple's use of sapphire in its iPhone 5s home button and lens cover. Rubicon says that LED lighting, now "in its infancy," will provide strong growth for several years to come. The company is also expecting growth from its new patterned sapphire substrates, and expects that the LED market will be "looking for more advanced sapphire substrates this year in terms of larger diameter, tighter specifications, and sophisticated patterns."